Kolfe Keranio, also spelled Kolfe Keraneo or simply Kolfe, is one of the 10 subcities of Addis Ababa, the capital of Ethiopia. As of 2011 its population was of 546,219. The district is located in the western suburb of the city, near the Gefersa Reservoir. 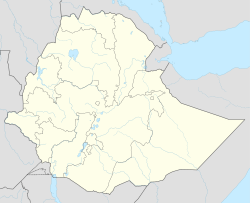 It borders with the districts of Gullele, Addis Ketema, Lideta and Nifas Silk-Lafto. ^ a b c d "Kolfe Keranio Archived December 3, 2013, at the Wayback Machine". City Government of Addis Ababa. Google. "Kolfe Keranio" (Map). Google Maps. Google.